Microcurrent Facials: How Does It Work & What Are The Benfits? Spa Sophia is always looking for the latest inventions and trends in the beauty industry, but we don't just jump on any new treatment. We carefully review them to determine if they're right for our clients. That's why we're proud to announce that we're now offering microcurrent facials in our Los Angeles spa. The Microcurrent Facial or "Electric Facial" has quickly become known as the 5 minute facelift, and has gotten the support of even the most skeptical estheticians. Want to know what exactly a microcurrent facial is, and what the benefits are? Read on! A microcurrent treatment, also known as microcurrent electrical neuromuscular stimulation, consists of gentle electric stimulation of muscles and tissue. During a microcurrent facial your skin cells as well as facial muscles will be targeted to tone and rejuvenate your face. How Does a Microcurrent Facial Work? Electric stimulation will make your facial muscles more taut, much like muscles in your body after a workout. This leads to a firmer skin and toned facial features. Gentle electric current is also known to increase blood circulation, production of collagen and elastin, and glycosaminoglycans. Glyco-what? Glycosaminoglycans, also known as "GAGs," are large carbohydrates that encompasses proteins like collagen and elastin, and are responsible for a skin elasticity and firmness. On top of that electric stimulation has been shown to increase cell regeneration. What Are the Microcurrent Facial Benefits? Microcurrent Facials are painless procedures (if they're done by trained estheticians that is, such as the ladies at Spa Sophia) and the effects last for about 48 hours. This makes them perfect for special events. The toned and taut facial muscles make you look younger and more awake, as does the more even skin complexion caused by increased blood circulation. On top of that, regular treatments lead to long term benefits, such as improved skin structure and elasticity. 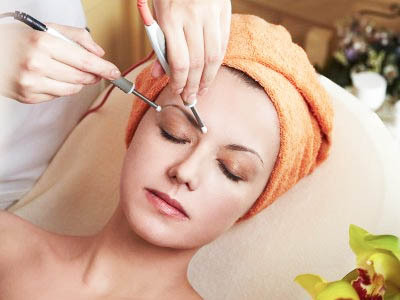 A skilled esthetician can even sculpt your face to achieve things like more facial symmetry, or more arched brows. Microcurrent facials are therefore sometimes recommended by plastic surgeons as a non invasive alternative to botox injections. But microcurrent facials can also enhance botox treatment, if timing and muscle targeting is well coordinated. How Often Should I Get a Microcurrent Facial? Microcurrent facials can be done at anytime before a special event, but to enjoy the long term rejuvenating results, treatments at regular intervals are recommended. We suggest starting with six or seven consecutive weekly visits, and then once doing a microcurrent facial once a month. Want to get a microcurrent facial? Book Spa Sophia's Anti-Aging Facial or microcurrent facial add-on online or by calling (310) 564 6676.